Police and the army last night sought to clear themselves and throw blame on alleged impersonators following reports that at least 12 people were killed by soldiers and the police during last week's nationwide protests against economic hardships. The military and the police were heavily deployed during the mass stayaway and were seen publicly firing live ammunition, beating up and harassing many civilians in broad daylight. There were also many reports of night raids and beatings by the combined forces mostly in high-density suburbs in cities and towns across the country. Police spokesperson Commissioner Charity Charamba together with her Zimbabwe Defence Forces counterpart, Colonel Overson Mugwisi, last night called a press conference where they disowned military and police members who have been exposed as having been ring leaders of looting and violence during the Zimbabwe Congress of Trade Unions (ZCTU) organised national stayaway. Mugwisi and Charamba refused to take questions from curious journalists who wanted to seek clarity on the denials which came days after the exposure of military involvement in the violent protests. They did not say why they did not want to answer questions. "We shall respond to your questions next time. We are very sorry we will not take questions today," Charamba said. The two claimed criminals had stolen army and police regalia during the disturbances in Chegutu and Epworth and used the same to commit crimes elsewhere. "Some of these uniforms worn by criminals were seized by rogue elements during the recent riots in Epworth and Chegutu. We are therefore giving an ultimatum to individuals who have retired, deserted, absented themselves without official leave from service to immediately handover uniforms either to the police or the Zimbabwe Defence Forces," Charamba said. A serving top military official, one Lieutenant Morrosi Carnage of Inkomo Mounted Regiment and a police officer, Ignatius Zuze were unmasked as leaders of the violent protests which led to the death of civilians and looting of shops in Epworth. Known Zanu-PF youth leaders were also arrested for allegedly inciting the protests, arson and looting. Commenting on the statement from the police and army, Jealousy Mawarire, the spokesperson of the opposition National Patriotic Front said: "The claim that there are non-security people committing atrocities while clad in police and military garb is very unconvincing and even if true, speaks of failure by the security sector to, not only run their institution, but also look after their tools of trade. He added: "Surely, we can't have an army or police force failing to account for their uniforms, weapons and officers, whether retired, dead or resurrected. The real issue is that there are divisions in the army, police and the state along the faulty lines within a disintegrating Zanu-PF. The centre is no longer holding and another coup is loading." In the past few days police have swooped on opposition and civic leaders arresting several legislators and leaders of civil society some of whom have been charged with treason. Meanwhile, there have been unverified claims of sharp divisions within Zanu-PF and government with sources saying the divisions would play out more openly in the near-future. Yesterday, Zanu-PF Harare provincial member and former Finance deputy minister, Terrance Mukupe made curious statements to the effect that all was not well in the ruling party. He said Mnangagwa would soon return to put an end to the current crisis but claimed the president was not the target of the unrest which he said was part of a bigger scheme and rift in the party. "I am worried with what's going on… The citizens are blind to what's really going on. The next 72 hours are going to be crucial regarding the path we are going to take as a nation. The truth will come out. President Mnangagwa is not the issue, Viva Zimbabwe," Mukupe tweeted. The United Nations has raised concern over the manner security forces handled the stay away. 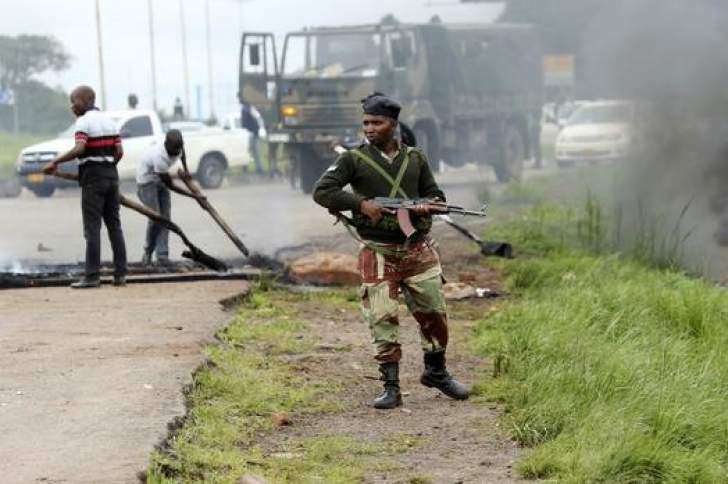 The world body through its human rights office based in Geneva said it was concerned that the security forces were using live ammunition against unarmed citizens and also suggested that criminals could have hijacked the ZCTU strike and embarked on looting and acts of violence. The UN human rights office spokeswoman Ravina Shamdasan said government should end the crackdown and excessive use of force by security forces. "The bottom line is that the use of live ammunition by security forces was excessive. This is not the way to react to expression of economic grievances by the population. There was some use of violence by the protestors as well, fires were set, shops and business were looted, as always, it is difficult to determine who did this. Was it opportunists taking advantage of the chaos to do that? Was it the demonstrators themselves, it is very difficult to understand that," said Shamdasan. U.N. Secretary-General Antonio Guterres appealed for restraint by the Zimbabwe authorities. "We are worried with the deterioration of the situation caused by the potential use of excessive violence in confronting the demonstrations in Zimbabwe," Guterres told a news conference in New York on Friday. The group of eminent former statesmen and respected leaders known as the Council of Elders also raised their voice over the behaviour of the military and the police in Zimbabwe saying government should engage its people and not use force. "The Elders express deep concern at the worsening social and economic situation in Zimbabwe and urge peaceful resolution of the crisis through inclusive dialogue," the Elders tweeted on Friday. On the same day the European Union had also condemned the violent crackdown by the Zimbabwe military.